Aaron's Homestead is a family owned and operated business with over 35 years of manufacturing experience. 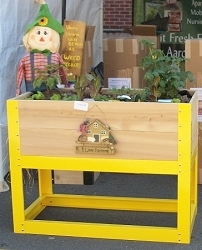 Our raised garden beds are proudly made of the best steel and Northern White Cedar right here in the USA. 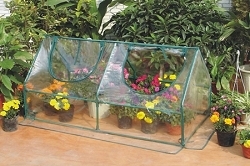 They are super durable and the sturdiest elevated planters on the market. We stand behind our planters. As a testament, our own gardens at home are raised in these very planter boxes. See what we've got growing! 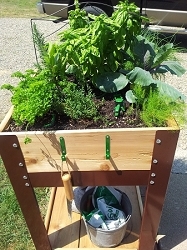 Herb and Salad Bowl Garden Planter - 2' x 2' x 36"
Come see us and our new products for a chance to win a $100 gift card to our online store! Watch Aaron Demonstrate The Features of the Best Planter Boxes! Our Elevated Farmer Boxes are 14" deep, so you can grow any and all root vegetables, get a good crop of tomatoes, and have enough root space that maintains moisture longer. 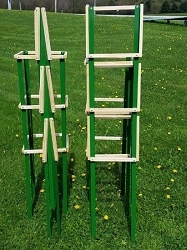 They come in several different colors and sizes to match your garden décor for years to come. Aaron's Planter Boxes last a lifetime and the quality is outstanding. 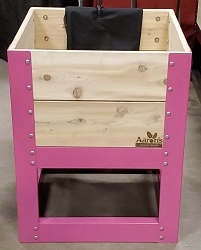 Our young grandkids (we have 9, ages newborn to 19) will still be able to use their planters when they are adults. 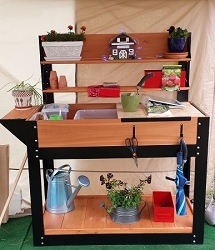 Where Can We Use Raised & Elevated Garden Boxes? ~ Retirement Communities & Senior Living Homes - Folks can fully enjoy gardening without having to stoop or kneel! 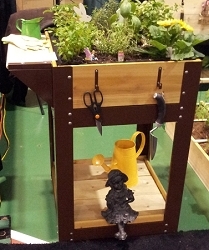 The inside of the planter that holds the soil and plants must be sturdy. 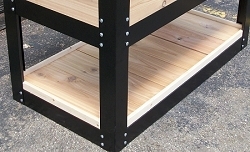 I have seen some planters that have aluminum frames with plywood bottoms. First, you should NEVER use plywood around things you are growing to feed your family. The adhesive that holds the plywood together is a formaldehyde compound! How long are you planning on using other planters? We have all seen, I’m sure, what happens to plywood when it comes into contact with water and soil on a constant basis. It is not rot resistant and will crumble and splinter, even if it is “marine” grade, so you might need a new one next year. Secondly, what if Fido or, heaven forbid, a small child is playing under that plywood bottom planter when it decides to give way, splat, what a mess and a liability. 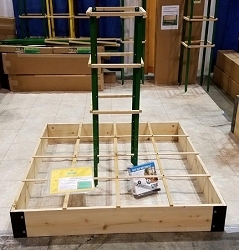 How Are The Raised Garden Planter Boxes Made? 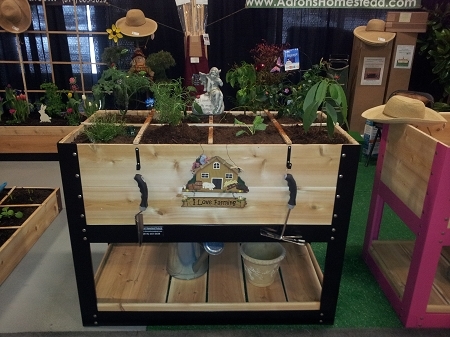 Our raised bed planters are designed so you will have many, many years of harvests and enjoyment from your garden. 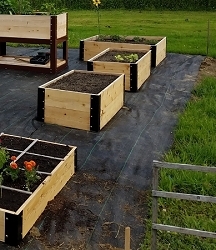 These raised garden beds are balanced and factor in the weight of the soil, water, and plants; which can weigh as much as 80 pounds per cubic foot. A 2’x 4’ x 14” deep planter has 8 cu.ft. of soil, which could be 640 pounds or more. Our planters have thick rot-resistant cedar slat bottoms with a reinforcing cedar 2x4 running right down the center of the planter that supplies extra support and helps to transfer the weight to the steel frame. 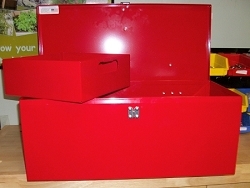 They are not screwed into the side boards so you do not have to worry about the screws failing to hold all of the weight, our steel frame holds the weight. The planters are put together using stainless steel carriage bolts, washers, and nuts rather than screws. This way the fasteners go through the wood, not into the wood that can lead to splitting and cracking, especially after a year or two of hot/cold temperatures. Screws and dove-tail joints have a tendency to come out (or apart) of the wood especially if that wood gets wet, dries, gets wet again, freezes, dries, or to put it plainly, your normal yearly changing of the seasons. We also sand and router the top edges of the cedar boards to alleviate rough wood and splinters. The sides do not taper or flare so there is even and consistent moisture throughout the planting area, no dried out sections like in a V-shaped planter box.